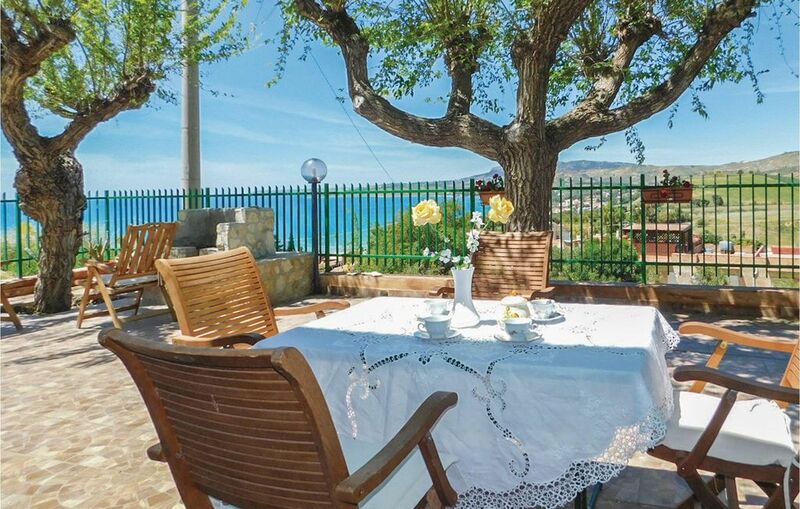 This holiday apartment is located near Sciacca on the south-west coast of Sicily, only 500 m from its famous beaches. The open terrace is ideal for outdoor dining. This is an ideal place for sea lovers, you can discover the beaches of Sovareto and San Marco or explore the beautiful bays of the Natural Reserve of San Marco - an untouched place ideal for snorkelers with a variety of marine flora and fauna. Torre Salsa is 15 km away and is considered to be one of the most beautiful beaches of Sicily in the nature reserve of Torre Salsa - famous for the breeding grounds of the sea turtles. Sciacca is also famous for its monuments such as The Cappella di San Giorgio dei Genovesi, the church of Sant'Antonio Abate and Castello Nuovo, from where you can enjoy a beautiful view of the city. Do not miss a visit to Agrigento (61 km) with its world-famous Valley of the Temples, an attractive destination for tourists from all over the world, a famous archaeological site for the preservation of Hellenistic temples. Selinunte is one of the pearls of Sicily, with its temples and its theater, and its ancient archaeological finds preserved in its museum - an indispensable trip during your holiday. There are numerous restaurants on the coast where you can try typical Sicilian dishes. See also IST018.